When you make a booking you guarantee that you have the authority to accept and do accept on behalf of your party the terms of these booking conditions. A contract will exist as soon as we issue our confirmation invoice. This contract is made on the terms of these booking conditions, which are governed by English Law, and the jurisdiction of the English Courts. You may however, choose the law and jurisdiction of Scotland or Northern Ireland if you wish to do so. If you had not seen these terms and conditions when you made your booking and you are not happy to proceed with the booking now that you have seen them please return all documentation to us or to your travel agent, within 7 days of receiving these booking conditions. Your booking will be cancelled and your monies will be returned in full, provided you have not commenced your travel. This clause does not apply if your booking was made within 10 weeks of travel. We provide full financial protection for our package holidays. For flight-based holidays this is through our Air Travel Organiser’s Licence number 2947. In the unlikely event of our insolvency, the CAA will ensure that you are not stranded abroad and will arrange to refund any money you have paid to us for an advance booking. For further information visit the ATOL website at www.atol.org.uk. We provide full financial protection for our package holidays that don’t include flights, by way of a bond held by ABTA. We will provide you with the services you have bought (or a suitable alternative). In some cases, where we aren’t able do so for reasons of insolvency, an alternative ATOL holder may provide you with the services you have bought or a suitable alternative (at no extra cost to you). You agree to accept that in those circumstances the alternative ATOL holder will perform those obligations and you agree to pay any money outstanding to be paid by you under your contract to that alternative ATOL holder. However, you also agree that in some cases it will not be possible to appoint an alternative ATOL holder, in which case you will be entitled to make a claim under the ATOL scheme (or your credit card issuer where applicable). We are a Member of ABTA, membership number Y1580. We are obliged to maintain a high standard of service to you by ABTA’s Code of Conduct. We can also offer you an arbitration scheme for the resolution of disputes arising out of this contract. The scheme is arranged by ABTA and administered independently. It is a simple and inexpensive method of arbitration on documents alone with restricted liability on you for costs. The upper limit on claims is £5,000 per person and £25,000 per booking form. The scheme doesn’t apply to claims which are solely in respect of physical injury or illness or their consequences. It can however deal with claims which include an element of minor injury or illness subject to a limit of £1,500 on the amount the arbitrator can award per person in respect of this element. Your request for arbitration must be received by ABTA within eighteen months of the date of return from holiday. For injury and illness claims, you can request the ABTA Mediation Procedure and we have the option to agree to mediation. Further information on the Code and ABTA’s assistance in resolving disputes can be found on www.abta.com. First, please check availability with our Reservations Department. Monies held by your travel agent are held on our behalf at all times. You must then complete the booking form, confirming on behalf of all members of your party, that you understand and accept the terms of these booking conditions. When you make your booking, you must pay a deposit, as detailed on the booking form, of £250 per person unless advised at the time of booking that a higher deposit applies (on some holidays we may charge a higher deposit to cover any costs we have to pay immediately to secure your booking with our suppliers). If you are making a reservation within 8 weeks of departure we will require the full payment of the holiday cost at the time of booking. Balance of payment is due 8 weeks before departure. Please note that the balance due date will appear on your invoice and NO REMINDER for settlement of this will be sent. Receipts for payment of balance are only issued upon request. If the deposit and/or balance is not paid in time, we shall cancel your travel arrangements. If the balance is not paid in time we shall retain your deposit. We strongly recommend that all participants on our tours have adequate travel insurance. If you require travel insurance from us please see page 80 for details. On your booking form please give us full details of your insurance company, policy number and emergency contact number. Tours are planned many months in advance. It is inevitable that some prices in this brochure may change, and we reserve the right to alter the prices of any of the holidays as necessary. However we guarantee that the price of your holiday, including any increases or reductions and as confirmed to you at the time of booking and shown on your confirmation invoice, is fully guaranteed and is not subject to any surcharges. If, after our confirmation invoice has been issued, you wish to change your travel arrangements in any way, for example your chosen departure date or accommodation, we will do our utmost to make these changes but it may not always be possible. Any request for changes to be made must be in writing from the person who made the booking or your travel agent. You will be asked to pay an administration charge of £50 per person and any further cost we incur in making this alteration. You should be aware that these costs could increase the closer to the departure date that changes are made and you should contact us as soon as possible. Note: Certain travel arrangements (e.g. Apex Tickets) may not be changeable after a reservation has been made and any alteration request could incur a cancellation charge of up to 100% of that part of the arrangements. You, or any member of your party, may cancel your travel arrangements at any time. Written notification from the person who made the booking or your travel agent on your behalf must be received at our offices. Since we incur costs in cancelling your travel arrangements, you will have to pay the applicable cancellation charges up to the maximum shown on the table below. NB: If the reason for your cancellation is covered under the terms of your insurance policy, you may be able to reclaim these charges. We plan travel arrangements many months in advance. Occasionally, we may have to make changes and we reserve the right to do so at any time. Most of these changes will be minor and we will advise you or your travel agent of them at the earliest possible date. We also reserve the right in any circumstances to cancel your travel arrangements. For example, if the minimum number of clients required for a particular travel arrangement is not reached, we may have to cancel it or re-cost the tour price and pass any extra costs on to you. However, we will not cancel your travel arrangements less than 8 weeks before your departure date, except for reasons of force majeure or failure by you to pay the final balance. If we are unable to provide the booked travel arrangements, you can either have a refund of all monies paid or accept an offer of alternative travel arrangements of comparable standard from us, if available (we will refund any price difference if the alternative is of a lower value). If it is necessary to cancel your travel arrangements, we will pay to you compensation as set out in this clause. In accordance with EU Regulation 2111/2005 we are required to advise you of the actual carrier operating your flight/connecting flight/transfer. We do this by listing carriers to be used or likely to be used on each tour itinerary. Any changes to the actual airline after you have received your tickets will be notified to you as soon as possible and in all cases at check-in or at the boarding gate. Such a change is deemed to be a minor change. Other examples of minor changes include alteration of your outward/return flights by less than 12 hours, changes to aircraft type, change of accommodation to another of the same standard. If we make a major change to your holiday, or we need to increase your tour price because of low numbers, we will inform you or your travel agent as soon as reasonably possible if there is time before your departure. You will have the choice of either accepting the change of arrangements, accepting an offer of alternative travel arrangements of comparable standard from us if available (we will refund any price difference if the alternative is of a lower value), or cancelling your booked holiday and receiving a full refund of all monies paid. In all cases, except where the major change arises due to reasons of force majeure, we will pay compensation as detailed below. NB: Cancellation charges and notification periods listed above do not apply to Pandaw River Cruises. Details will be advised at the time of booking. Force Majeure: We will not pay you compensation if we have to cancel or change your travel arrangements in any way because of unusual or unforeseeable circumstances beyond our control. These can include, for example, war, riot, industrial dispute, terrorist activity and its consequences, natural or nuclear disaster, fire, adverse weather conditions, epidemics and pandemics, unavoidable technical problems with transport. If you have a problem during your holiday, please inform the relevant supplier (e.g. your hotelier) and our resort representative immediately who will endeavour to put things right. If your complaint is not resolved locally, please follow this up within 28 days of your return home by writing to our Customer Services Department at the address below, giving your booking reference and all other relevant information. Please keep your letter concise and to the point. This will assist us to quickly identify your concerns and speed up our response to you. It is strongly recommended that you communicate any complaint to the supplier of the services in question as well as to our representative without delay and complete a report form whilst in resort. If you fail to follow this simple procedure we will have been deprived of the opportunity to investigate and rectify your complaint whilst you were in resort and this may affect your rights under this contract. Please also see details above on ABTA. If the contract we have with you is not performed or is improperly performed by us or our suppliers we will pay you appropriate compensation if this has affected the enjoyment of your travel arrangements. However we will not be liable where any failure in the performance of the contract is due to: you; or a third party unconnected with the provision of the travel arrangements and where the failure is unforeseeable or unavoidable; or unusual and unforeseeable circumstances beyond our control, the consequences of which could not have been avoided even if all due care had been exercised; or an event which we or our suppliers, even with all due care, could not foresee or forestall. Our liability, except in cases involving death, injury or illness, shall be limited to a maximum of 3 times the cost of your travel arrangements. Our liability will also be limited in accordance with and/or in an identical manner to the contractual terms of the companies that provide the transportation for your travel arrangements. These terms are incorporated into this contract; and any relevant international convention, for example the Montreal Convention in respect of travel by air, the Athens Convention in respect of travel by sea, the Berne Convention in respect of travel by rail and the Paris Convention in respect of the provision of accommodation, which limit the amount of compensation that you can claim for death, injury, delay to passengers and loss, damage and delay to luggage. We are to be regarded as having all benefit of any limitation of compensation contained in these or any conventions. You can ask for copies of the transport companies’ contractual terms, or the international conventions, from our offices (see below). Under EU law (Regulation 261/2004) you have rights in some circumstances to refunds and/or compensation from your airline in cases of denied boarding, cancellation or delay to flights. Full details of these rights will be publicised at EU airports and will also be available from airlines. However reimbursement in such cases will not automatically entitle you to a refund of your holiday cost from us. Your right to a refund and/or compensation from us is set out above. If any payments to you are due from us, any payment made to you by the airline will be deducted from this amount. NB: This clause does not apply to any separate contracts that you may enter into for excursion activities whilst on holiday. 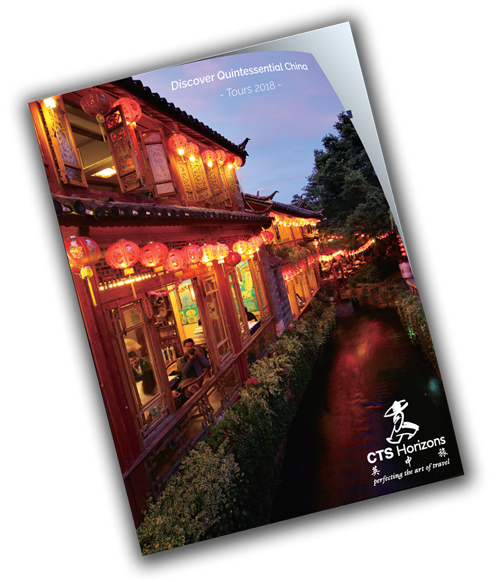 A great journey through China, offering an in-depth exploration. 12 days visiting Beijing, Xian and a fabulous Yangtze Cruise. A journey through Shandong to discover the roots of Confucianism and Chinese spirituality. Explore Yunnan's minority tribes on this fascinating tour. Explore two of China’s most fascinating regions - Sichuan and Guizhou. An epic journey for those who yearn to discover the Himalayas.